Blender is a free open source 3D program. 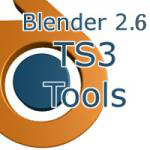 With Blender and this set of tools, you can create 3d meshes to be used in TS3 as objects, i.e. chairs, tables, ect. You can get Blender 3d 2.65a here. THIS WORKS FOR BLENDER 2.63-2.7+ AND IS ONLY FOR OBJECTS. Mesh Swap - swaps your mesh with the imported EA mesh. 1. Download and extract the "io_TS3_tools.py" and put it where you can find it. 5. Navigate to where you extracted the file and select the "io_TS3_tools.py" and click "Install Add-On". TS3 Tools is added to the the list. 6. Click the check box to the right of the TS3 Tools in the list. The importer/exporter is added to the File->Import menu, and the TS3 Tools and TS3 Image Loader panels are added to the Properties Editor under Scene. 7. Close the User Preferences window, and hit CTRL+U to save as default(if you want TS3 Tools to be there next time you start Blender). 1. Select the MLOD/MODL in s3pe, right click on it, and select "to s3m2b". Save the file in it's own folder. 2. 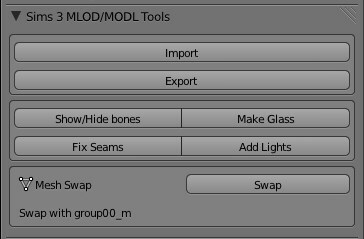 Start Blender, and in the Properties editor under Scene, click the Import button in the TS3 Tools panel or go to File->Import->Sims 3 MLOD/MODL. Navigate to the your folder and select the name_filebase.s3m2b file. When creating you new mesh, to keep sharp edges, you will have to use the Edge Split modifier. Also, UV mapped parts that are separated on the map should be split in the mesh. The exporter only exports changes made in Edit Mode, changes made in Object Mode are ignored. 1. Right-click on the new mesh(s), the hold SHIFT and right-click on the mesh you want to replace. 2. Click the 'Swap' button. 1. Right-click on the mesh and press TAB to go into Edit mode. 2. Select the vertices you want to add to a joint. In the Properties editor, select the "Object Data" panel(button with triangle/w dots at the corners). 3.In the "Object Data" panel under 'Vertex Groups', select the joint you want to assign to, and click assign. 1. In the Properties editor under Scene, click the Export button in the TS3 Tools panel or go to File->Export->Sims 3 MLOD/MODL. If you haven't triangulated your meshes(CTRL+T in Edit mode), click the Triangulate checkbox in the export options panel(bottom-left of the file select window). Navigate to the folder you imported from, select the name_filebase.s3m2b file, and press "Export MLOD/MODL". 2. In s3pe, open the package. Right-click on the MLOD/MODL you exported from and select 'from s3m2b'. Navigate to your newly created .s3m2b file and click 'Open'. This function allows you to specify groups to be left untouched on export. Any groups with this setting will be skipped during export, leaving the original group unedited. This is perfect for making beds, as you can exclude every group but the frame and dropshadow, and edit them without having to worry about borked normals on the mattress due to Blender recalculations. Just select the group(on at a time) to exclude and press the 'Exclude from Export' button. Do the same to re-include a group. note: You must have a UV/Image editor window open in your scene. Also, Material mode must be set to GLSL and Shading method to Textured to view the results on the mesh. See this tutorial. 1. Select the groups you want to bake. 2. In the TS3 Tools panel in the EZ Bake section, select the size of the image, and the baking method you want to use. 3. Click the Bake button. Press ALT+Z to change to Textured shading and see results on the mesh. 4. In the UV/Image editor, go to Image->Save As to save you image. Default format is .png. you will have to open your image in an graphics program to save it as a .dds. note: Material mode must be set to GLSL and Shading method to Textured to view the results on the mesh. See this tutorial. 1. Select a group. Click Open under whatever image you're trying to load(multiplier, mask, overlay, specular, or dropshadow). 2. Navigate to the image and click Open. 3. Press ALT+Z to change to Textured shading and see results on the mesh. 4. To remove an image, simply click the X next to that image. 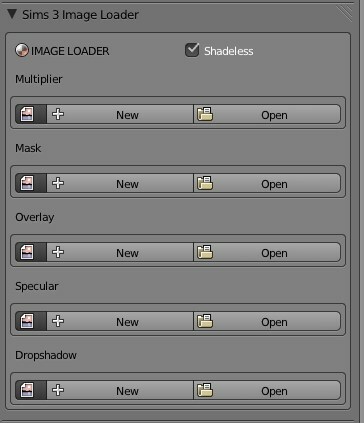 To view the specularity(if specular image is loaded), make sure the 'Shadeless' box is unchecked and you have lights in your scene(or just use 'Add Lights'). 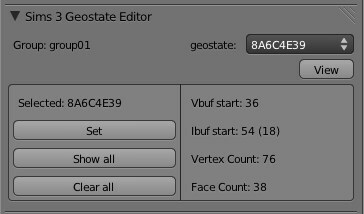 With an object containing geostates imported, and its images loaded, select the group containing the geostate. In the geostate editor panel, select the geostate you wish to view and click 'View'. 1. Make sure you're viewing the geostate you wish to edit and switch to edit mode. 2. Click the 'Show All' button to see the complete mesh. 3. Select the faces you want included in the geostate, deselect the the faces you don't want included in the geostate. 4. Click the 'Set' button to set the geostate. 1. While in Edit mode, select the only the vertices of the seam(it may be easier to select the edges in edge select mode). Do the same for all groups that have seams you want to fix. 2. While in Object mode, select all the groups that have seams to fix and click the Fix Seams button. If there were no problems, 'Alignment complete' will printed in the Console. Simply click the button to hide all bones in the object, and click again to show them. Bones are hidden by default. Select the group(s) you want to make glass and click Make Glass. Press ALT+Z to change to Textured shading and see results on the mesh. Importing more than one MLOD/MODL can cause problems. You should start a new project. 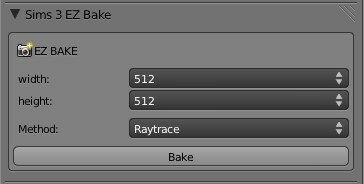 -Fixed RGB and Specular Bake not being able to bake at 2048. -added 'Exclude from Export' function to ignore specified groups from export(original group is left untouched). -added support for new Blender 3d exclusive format(.s3m2b). .s3asc files can still be opened. -fixed file filtering for export, added .s3m2b to import/export filters. - Fixed bug that ignored second UV in objects with two UVs. Second UV is now included. Thanks to Ciexari (used his scripts as a reference), Wes Howe, Inge and Peter Jones, orangemittens, and all the those who helped in testing.